The St. Johns River is an anomaly. Unlike nearly every other river in the United States, it flows north to the sea. It’s the ideal setting for Huckins Yachts, a custom builder that’s snubbed marketplace trends since the late 1920s. 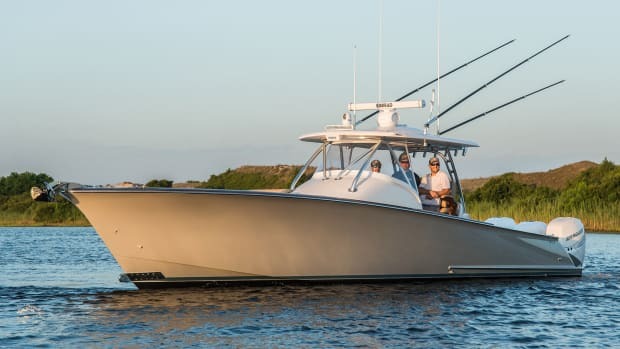 I recently stopped in to the Jacksonville facility to see owner Cindy Purcell and her company’s latest retro-inspired build, the Hybrid Sportsman 38. Visiting the Huckins yard is a step into boatbuilding history. I noted multiple vintage Huckins’ at quays and a few undergoing restorations in the large post-and-beam (no metal here) shed. The office is chockablock with 91 years of photography, detailed, handwritten charts and other parts unique to Huckins. A drafting office lined with wooden, flat-style file cabinets houses their archives. “We wanted to put out something that’s different. What’s on the marketplace is staid,” Purcell told me, “We’re in the unique position to pick it from our heritage. We can pull [the design] from our archives,” she said with a wave to the files. She showed me the 38’s inspiration: A black-and-white image of a 1930s Huckins with a smiling woman sitting in the cockpit, a 48-star American flag waving in the breeze. Purcell points out the stanchion design has barely changed. “We kept the best of the old and redesigned [the 38] to fit today’s lifestyle,” commented Purcell. 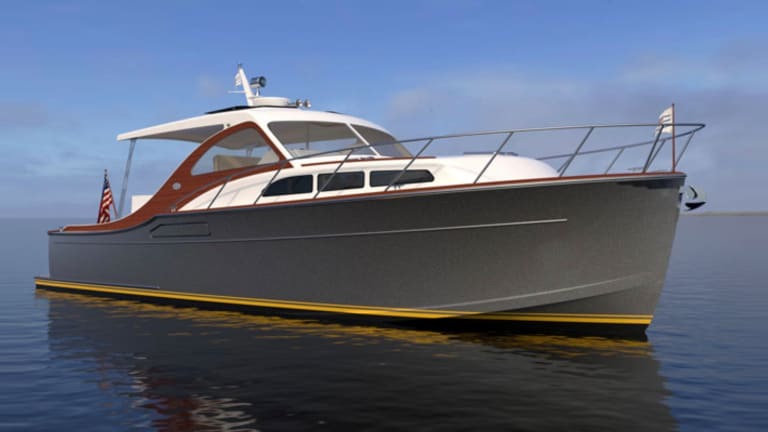 The renderings for the new Sportsman 38 retain the Art Deco-inspired looks with an updated coach roof and a redesigned interior. 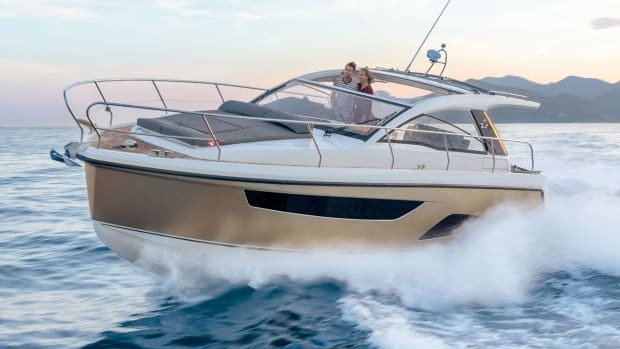 Power side windows and a pair of electric sunroofs in the hardtop ventilate a command bridge that’s served by a mini galley with wet bar, icemaker, fridge and 16-bottle wine chiller. 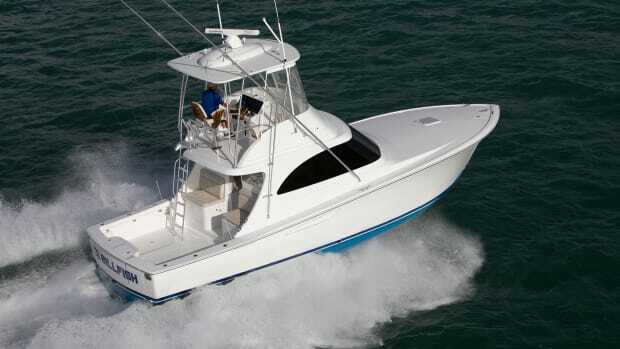 For an evening on the hook, a full galley sits belowdecks with a V-berth that electrically converts to a queen. 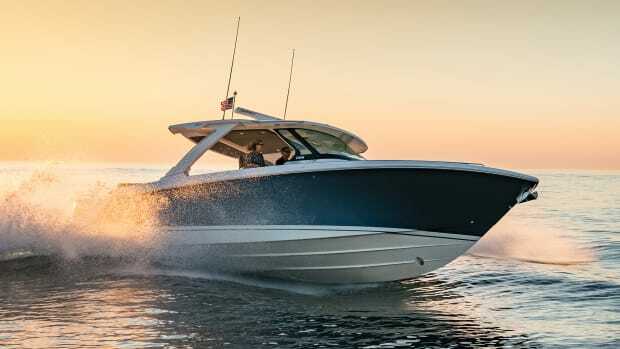 The Sportsman’s traditional looks belie what lies in her engine bay clutched to the propshaft and pair of 380-hp Cummins QSBs—twin, 20-hp Elco electric motors. The Elcos are matched to two banks of the latest-gen lithium iron phosphate batteries that offer more stability and a longer cycle life that its predecessors. 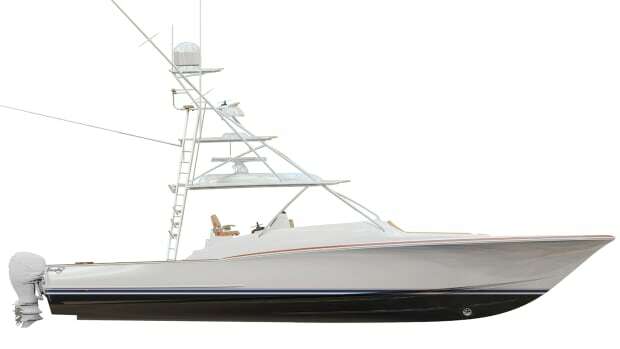 With a flip of a switch, Purcell claims the 38 will cruise silently at 7 knots solely under electric power. 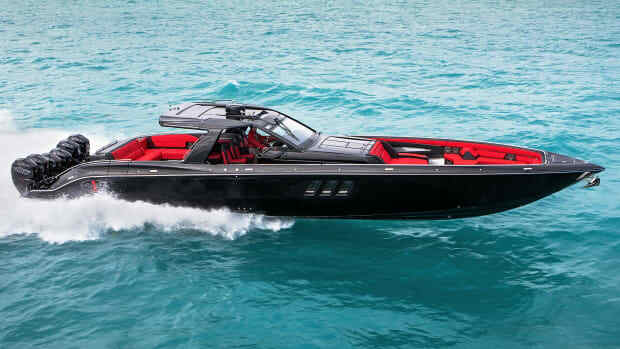 Kick in the mains and she’ll cruise at 30 knots with a top end that should exceed 35. 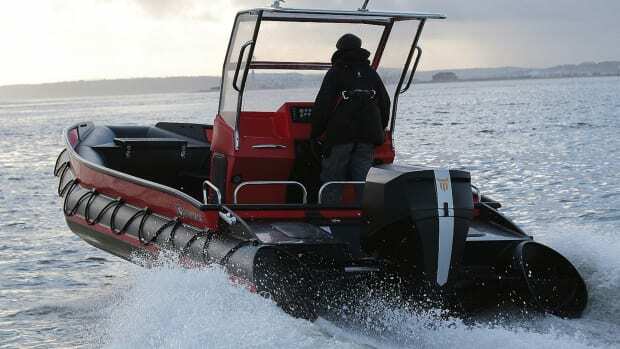 In a reflection of these times, the semicustom boat is offered with twin outboards as well—renderings show Suzuki 350s mounted on the swim platform. 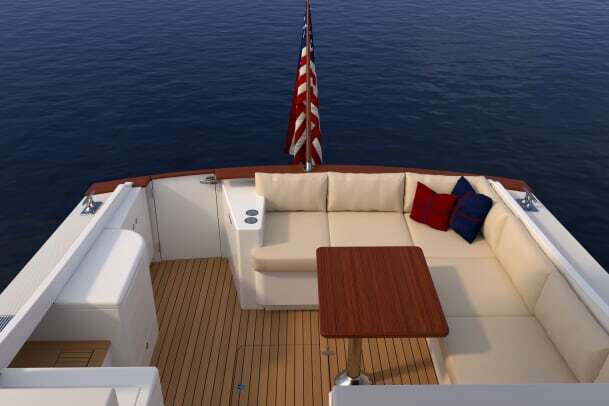 It would require moving a few things around, something the builder has addressed with a seasoned in-house team and Ullberg Yacht Design. 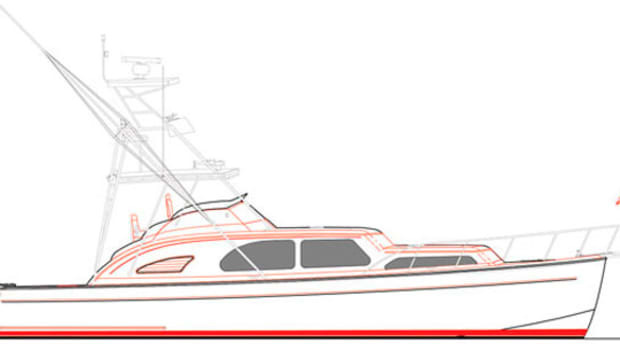 Purcell nods to a 56-foot jet boat that Huckins built a few years back as evidence of their experience with myriad propulsion packages on their patented Quadraconic hull. There was a palatable feel of excitement among the Huckins team as I inspected Hull No. 1 under construction. 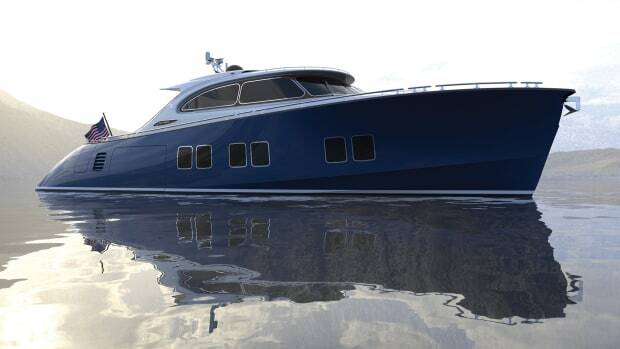 It will be the builder’s first fully resin-infused boat and is slated to be their first semiproduction vessel. They look to have it ready for the 2019 Newport show. Huckins has made waves by proudly staying at odds with fads while offering the modern accouterments customers want in a classically styled package. 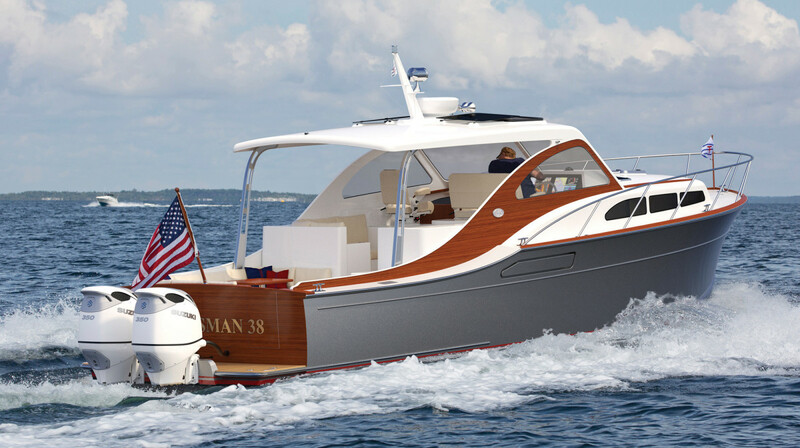 The Hybrid Sportsman 38 looks to keep this trend intact.